Make sure that you don’t miss us during your stay in paradise! 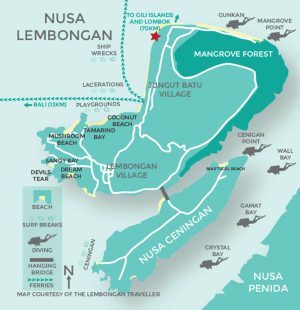 Serenity Yoga Lembongan is located on the beach at the northern end of Jungut batu village on Nusa Lembongan. We are away from the busy harbor in a quieter area of the island surrounded by seaweed farmers and absolute peace and serenity. It’s a short walk along the beach or bike ride from town down the main road towards the mangroves. Shortly after Blue Corner Dive, and just before Puri Kirana Bungalows, you will see our signs on the left – follow the signs down our little path and you will find our beautiful Shala at the bottom.